Cuban filmmaker Fabián Suárez has won both the Best Fiction and Best Cinematography awards at the 15th edition of Muestra Joven. OPEN AIR FILMS IN THE VONDELPARK! Travelling around the World without leaving the city? This Summer we make it possible! The seventh edition of World Cinema Amsterdam will take place 18 to 27 August. Experience the atmosphere of World Cinema Amsterdam 2015! Take a look at our photo reports of the parties, Q&A's, open air screenings, guests and visitors. Become a member of our photo stream community en keep up with the last news about the festival... in image! 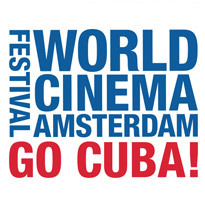 Yesterday (14 June), World Cinema Amsterdam, the film festival dedicated to world cinema, announced in Havana which Cuban filmmakers will receive financial support as part of the GO CUBA! project that was kicked off in 2015. For the second round, for the group of 2016, eight film projects have been selected: documentaries, shorts and feature films. ‘Caballos’ by Fabián Suárez... awarded! Filmmaker Fabián Suárez visited Amsterdam last year during the 6th edition of World Cinema Amsterdam to present his impressive debut film Caballos. The film has recently (April 11, 2016) been awarded as Best Fiction at the 15th edition of Muestra Joven ICAIC in Cuba. Open air programme in the Vondelpark announced! This year we will be screening again four amazing films in the Vondelpark, in the open air. We start long before the festival begins, on Friday August 5. Come and enjoy one of our World multicultural films under Amsterdam's starry sky. The sessions will start as soon as the Sun sets, around 21.30h. Travelling around the World without leaving the city? This Summer we make it possible! World Cinema Amsterdam will celebrate its seventh edition 18 to 27 August in Rialto and De Balie. Prior to the festival we kick-off with our traditional Open Air screenings at the Vondelpark (5, 6 & 12, 13 August). World Cinema Amsterdam had already announced the project during its most recent edition this August: Go Cuba! - an initiative through which the festival aims to financially support independent Cuban filmmakers. Many applied, nine of these applications were honored. Their names were made public on December 8 during the Havana International Film Festival.